With dazzling sea and beach views and Mawgan Porth's sandy shore within a 10 minute stroll, Windrush delivers coastal escapism in spades! 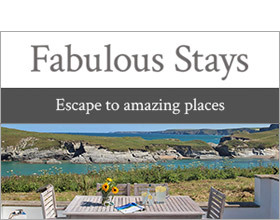 Close to lively resorts, picturesque coves and superb beaches on the spectacular north Cornish coast, it's the perfect homely bolthole for tranquility, relaxation and recreation. Set against the dramatic landscape of cliffs and caves, Mawgan Porth boasts an expansive beach with breathtaking views, with beach-front cafes and pubs for refreshment. Join the surf school, hire the gear and enjoy adrenaline fueled water fun, patrolled by seasonal lifeguards. Rock pools are ready for exploration so bring nets and buckets. The National Trust beach at Bedruthan Steps has striking rock stacks and is reached within a 30 minute walk along the South West Coast Path or a five minute drive. Visit picturesque St Mawgan with tea rooms and gastro pub or the riding stables within three miles. St Eval go-kart track and Merlin Golf course are closer still. The Spa facilities at The Scarlet Hotel and Bedruthan Steps Hotel will entice you in for pampering by the sea. Follow the scenic coast road to the popular resorts of Padstow with harbour, eateries and galleries galore. Newquay, with zoo, Waterworld swimming pool and aquarium is just a 20 minute drive away and stunning Watergate Bay with celebrity chef Jamie Oliver's Fifteen Restaurant is even closer. Windrush sits in the village of Trenance and offers well presented and spacious, homely accommodation. The terraced balcony is a sunny sanctuary for lazing on loungers, dining alfresco and nightcap tipples. The sitting room boasts ocean, beach and country views, an open fire and big squashy sofas - so kick-back and chill. Socialise around the dining table whilst the cook preps dinner in the well equipped, uber contemporary kitchen. Back outside, the garden is attractive with gently sloping lawn and terrace with paths, steps and pond - please supervise young children. The five bedrooms, 3 of which are on the ground floor, guarantee restful sleep, and surf gear and cycles can be stored in the garage, where you can practice your table tennis skills. Over two floors. Five bedrooms: 1 x king-size double and 2 x single plus family bathroom on the ground floor. 1 x double. 1 x twin with en-suite shower room with shower, basin and WC. Bathroom with bath, shower, basin and WC. Kitchen. Utility room. Dining room. Sitting room with open fire. Converted garage for storage only. Note: Garage for storage only - not cars.